I'm Michel Martin and this is TELL ME MORE from NPR News. Coming up, I share my thoughts about what's behind the Occupy movement. That's my weekly Can I Just Tell You commentary and it's coming up in a few minutes. But first, on this program, we often talk about one of the most intense and emotional political debates: immigration. And one reason we talk about it often is that it's right in front of us. We see it playing out in the news, in hearings in Congress and confrontations between people who favor more expansive immigration policies and those who want more restrictions. But what we don't often see or hear is what it's like to be in that middle space between legal and illegal or to be related to someone who is. We don't often hear about what it's like to be in limbo. We begin today a series of conversations about this experience with a story of a man who lived a life of uncertainty for many years. After literally jumping the fence between Mexico and the U.S., he became a farm worker in the fields of Southern California, picking tomatoes, corn and broccoli. Later, he shoveled sulfur and scraped fish lard from tankers, but eventually, his life took a very different turn. Alfredo Quinones-Hinojosa went on to graduate from Harvard Medical School. 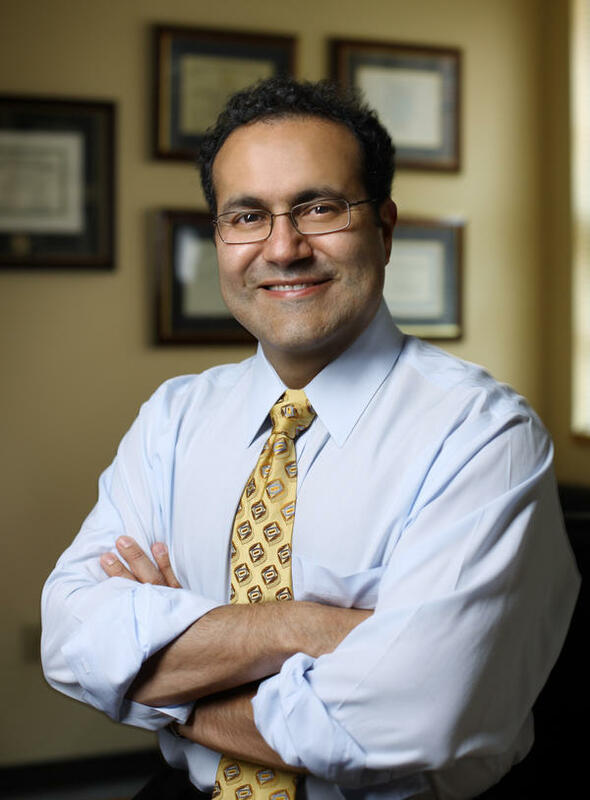 He is now a highly respected neurosurgeon and he talks about his journey in his book, "Becoming Dr. Q: My Journey from Migrant Farm Worker to Brain Surgeon." And Dr. Quinones-Hinojosa joins us now from our studios in Washington, D.C. Welcome. ALFREDO QUINONES-HINOJOSA: Thank you, Michel, for having me. It's quite an honor and a pleasure to be here with you today. MARTIN: Well, likewise. Thank you. Your beginnings are ones that many people will recognize as their own. I mean, you talk about growing up in Mexico. There were times when you and your siblings did not have enough food, and you talk about seeing your father cry. Why was he crying? QUINONES-HINOJOSA: Well, Michel, as I look back now, I'm beginning to understand that he was probably depressed, you know, because he was a young man. He was in his early 20s. He had, you know, five children and he could not put food on the table. And I started working, as you know from my book, when I was five years old, in a gas station to try to help and shoulder some of the burdens that we had as a family. And yes, my beginnings were humble and yes, we went through a lot of difficult times. But, at the end of the day, I've got to tell you one thing. I have fond memories of my time as a child. MARTIN: So why did you decide to leave Mexico? You did very well in school, I just want to point out, and you had sort of desires of being a teacher. In fact, you were a teacher at a very young age, but you did decide to leave. Why? QUINONES-HINOJOSA: I was hungry, literally. And I'm not talking about hunger for success. I was literally hungry for food. My stomach was empty and people say, but you had a choice. Well, when you are hungry and you have a dream of trying to put food on table for your family, your parents and your siblings, there are not too many choices. MARTIN: You know, it's often said that immigrants do the jobs that Americans won't do or don't want to do and you describe just some really backbreaking experiences in your book. But I just want to ask you about the time you fell in a tanker. QUINONES-HINOJOSA: I was fixing this tank. These are like really highly complex type of safety valves that these tankers have so they don't explode, so the petroleum gas doesn't spill out. So I was in charge of fixing them and, when I was on the top and I (unintelligible) this knot, I got shocked by the fumes and, next thing I know, I'm heading down through this hole and there's no oxygen. I found myself at the bottom of this 35,000 tanker fighting, literally fighting, to try to survive. And at the moment that I reached the top after I was at the bottom, reached the top and I held onto one of my coworkers' hand, my father showed up. And he was my age, Michel, back then as I am today. Forty-three years old and he saw me dropping down, so they wouldn't let my father go in because they said he was "too old," quote, unquote. But at the end, my brother-in-law came in, not once, but twice. He risked his life in like an adventure, like out of an action film, they rescued me from the jaws of death. MARTIN: Well, yeah. It was terrifying to read, I'm sure even more terrifying to experience. So how did you go from there to medical school? You know, there's a saying - and I don't remember who said this. It's been attributed to different people that it's hard to be what you cannot see. MARTIN: And I'm wondering how - here you are in the, you know, picking corn and broccoli and tomatoes and you're at the fish tank, you know, scraping fish lard from the tank. MARTIN: Did you envision a brain surgeon? MARTIN: Did you envision yourself? MARTIN: So how did you get the vision that you could do it? QUINONES-HINOJOSA: I had faith that if you work hard, my life was going to turn. And I did it. And I worked with such passion back then. And that's what I tell the youth sometimes; they might not know what they want to do tomorrow, but if they work hard today I promise you that their dreams, which they may not know what they are today, their dreams will come true. MARTIN: If you're just joining us, I'm Michel Martin and you're listening to TELL ME MORE from NPR News. As part of our In Limbo series, I'm speaking with Dr. Alfredo Quinones-Hinojosa. He's a former migrant worker who has become a respected brain surgeon. MARTIN: ...it would work out eventually or what was it like? QUINONES-HINOJOSA: Oh I do remember when I was working in fields, I remember picking the weeds, you know, going through this beautiful fields, and every time I would see the Immigration Naturalization Service - and they used to do all these raids, you know - and I'll be in the middle of the fields. And I just knew that that could be me next. You know, because they don't stop with small crews and I was blessed at the time that I was working and doing already in the fields very specialized work, and I would be in small crews. But when you are sometimes in very large crews, that's when they would come in. But I live in fear every single day. But at the end of the day I didn't let that rule my life. And remember, by the 1980s, Reagan had the amnesty. That's not how I eventually became a U.S. citizen. MARTIN: Yeah. I was going to ask you that. QUINONES-HINOJOSA: Remember, it was the immigration reform of California. So around the same time, 1986-1987, it said if you work in the fields for X amount of days, we will give you working authorization. If you pay your taxes, if you are an outstanding citizen and you keep working, that will turn into a temporary green card, which in turn, if you keep doing the same thing, will be a green card. And then, by the time I was at Harvard Medical School, in 1997 at Faneuil Hall, I had one of the most beautiful celebration. That's when I became an American citizen. MARTIN: How long did it take overall, for you to become a citizen? MARTIN: Ten years. Did you cry? QUINONES-HINOJOSA: Of course I did. I was sitting right there and I was among 500 people and I did cry. I mean, it was a dream come true. But I tell you, Michel, I also cried because my parents, all right, who had been trying to become U.S. citizens, hadn't been able to accomplish this. And I had an anecdote in my book where I was treated differently when I went to my U.S. citizen exam, because I was a Harvard medical student. And that is sad - that sometimes we treat people, but I was the same guy. MARTIN: Well, but what about that, though? I mean let's just talk about that for a minute. There are those who would argue that that's exactly right, that the whole purpose, that every country defends its borders and that every country has a right to select whom it will admit, but if you had not had the privilege of being born there. And that why shouldn't a country decide that it wants more neurosurgeon than it wants migrant workers? QUINONES-HINOJOSA: I would say that when I first came to the United States, I wasn't a brain surgeon, but I'm still the same guy. My DNA is the same. I haven't changed. And I can assure you that among people who come to the United States today, whether they come from privileged backgrounds or humble backgrounds, is our next Einstein, is our next Nobel laureate that we just have failed to identify. So we make, we pre-select on the people that are here in the United States, based, sometimes, in race, skin color, social status, when in reality we all have a brain and we have the potential. We have failed to recognize how to, sort of, continue to make those people grow in a positive way. MARTIN: There's one thing I did want to get, though, that where's that critical moment where you were able to - 'cause I know you went to Berkeley. MARTIN: So how, what was the critical piece that got you out of the fields and out of manual labor and onto the track that you are on now? What was it? QUINONES-HINOJOSA: It was, the critical person that got me out of the fields was my own cousin telling me that I was going to spend the rest of my life working as a migrant farm worker. And nothing wrong with being a migrant farm worker, Michel. I love the farms. I love working with my hands. But I had dreams and I was not challenged anymore when I was in the fields. And I refused to believe that I was going to be there for the rest of my life. MARTIN: ...is that their education gets truncated and they get pulled out of school to work. QUINONES-HINOJOSA: Well, after that I ended up going to community college and then I met my first mentor, who took me under his wings and began to teach me the ways. But he was, that's how I got introduced, it was mentorship, Michel. It was people who believed in me, but they are not people who looked like me. If I waited to a mentor that looked like me, I would never find one at the time, and probably even now. So you have to look around for people who are good people, and they don't necessarily have to look like you. And that's exactly what got me going from point A to Berkeley, eventually, to Harvard, residency, and now where I am today. MARTIN: ...hey, you're too smart to be a Mexican. QUINONES-HINOJOSA: Yes. I think it was the internal one. That means both internal, my internal circle. I got to tell you, I don't think my cousin meant harm. He just wanted to bring me down from the clouds, so if I fell I wouldn't hurt myself physically, emotionally, you know. So that internal group of people became crucial, because in the meantime, as I'm getting people telling me you can't do this, my father and my mother said you can do anything you want to do, son. So that was critical in my life. But then also your own doubts, Michel, in your own heart. I question myself at the time and I question myself today, whether or not I can do what I do, and that's going back to keeping myself humble. But at the time it was much more challenging, because I didn't have a vision. I was working in the dark. I just had faith. Now at least I have a little bit more of a vision, you know, but I still - my faith has only grown stronger, to be honest with you. MARTIN: ...this is sort of propaganda, that we're putting forward somebody like you who is so very accomplished as an example of what immigration can do. And being in fact, you're different. What would you say to that? QUINONES-HINOJOSA: I would say that I am not especially brilliant. I am especially driven and I work really hard, and that's what defines me, probably, and sets me apart than many other people. But what I would say is that there's always going to be people are skeptical. And if they believe that my message is that everybody should be a brain surgeon, that everybody should be an astronaut, then they are missing my message. That's not what I'm saying. What I'm saying is that we need to encourage our youth to be the best to whatever they want to be. My argument is the following, Michel, is that by the year 2050, and this is an underestimate, all right. By the year 2050, one out of four people in this country will be of Hispanic origin. Whether you want to admit it or not, whether you want to face it or not, that is the reality. This is the future of our country. MARTIN: Those are the people who are going to be doing your brain surgery. QUINONES-HINOJOSA: Well - or those are the people who are going to be carrying the economy. And if we don't educate them today, you can imagine, we will be the people who are going to be outsourcing. So we have to deal with the problem right now. MARTIN: Dr. Alfredo Quinones-Hinojosa is an associate professor of neurosurgery and oncology at Johns Hopkins University. He also directs the Brain Tumor Surgery Program at Johns Hopkins Bay View Hospital. His new book is called "Becoming Dr. Q: My Journey from Migrant Farm Worker to Brain Surgeon," and he was kind enough to join us here in our studios in Washington, D.C.
Dr. Quinones-Hinojosa, thank you so much for speaking with us. QUINONES-HINOJOSA: Thank you, Michel, for having me. I'm quite honored. MARTIN: And please tune in tomorrow, as we continue our In Limbo series with the story of Chinonye Omeje, known as Chi Chi. She came to the U.S. six years ago, as a burn victim from Nigeria. She came to receive medical treatment for her injuries, but because of the terms of her medical visa, she and her mother cannot leave the U.S. They've not seen any other members of their family back in Nigeria for years. More from our In Limbo series tomorrow on TELL ME MORE. Transcript provided by NPR, Copyright NPR.